Because tests are commonly viewed in terms of offering quantitative feedback on the presence or absence of defects in specific situations, Good Unit Tests need to both illustrate and define the behavioral contract of the unit in question. Do you have GUTs? Some people dismiss words such as skill, diversity, problems, and mission as being too ambiguous to be useful. But one tester's ambiguity is another tester's gauge for assessing consensus on a project and how to achieve that consensus. What if you had a picnic and no one brought potato salad? Find out what picnic planning and steam engines have to do with project success and not just satisfying your customers but delighting them. Pair programming is one of the most controversial agile practices. Managers are concerned about the costs and developers are concerned about personal agony. But there also are many benefits. If you are thinking about trying pair programming, here are several reasons why you should. Is it really so hard to produce software that works? When was the last time you read a software license agreement? Most are one-sided statements that limit the product developer's liability. It's time to move away from "Use at your own risk" software and be upfront with customers about the true cost of quality. The Gang of Four's design patterns have a special place in many programmers' hearts. But it's time to look beyond the GoF twenty-three and realize they aren't the only patterns in the universe. A switch to agile often conflicts with personal career goals such as maintaining the status quo and working no harder than necessary. 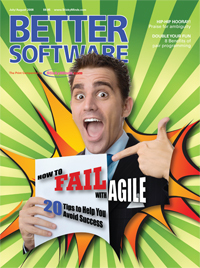 These twenty guidelines will help you sabotage your agile project, helping you fail quickly and spectacularly.